Category Archives: "Eczema and Dermatitis"
Cold air, harsh winds, and indoor heating can wreak havoc on your skin if you have eczema. Symptoms usually get worse this time of year, and you may notice more frequent flare-ups than you experienced during the summer. Sometimes called the “winter itch,” winter eczema causes not only dry skin, but more flaking and itching. 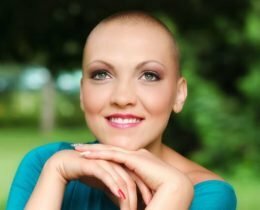 Cancer & Confidence: Let Us Help You Feel Beautiful! Let’s not beat around the bush: cancer treatments are tough. If you’re going through chemotherapy and/or radiation, you know how it goes. Side effects may include nausea and vomiting, fatigue, and skin redness, fragility, and inflammation. You may go through hair thinning or hair loss, and your fingernails may get weak and break more often.